This week, Harry and Mia each received a lovely parcel in the post, addressed to them individually. Inside was a book each from Wonderous Ink, a very special book which not only mentions them by name but also uses the letters from their names to remind them how wonderful and unique they are. The books are designed for children aged 2 - 8, but a book also makes a nice gift to buy for a newborn. The story follows a boy or a girl who is curious to know what makes them different from all the other children in the world. They go out for a walk to ponder the question, and find that they are lost in an enchanted forest. But on their way they meet a variety of different characters, each with a problem that the child is able to solve by using a letter from his or her name. In return the character gives them an attribute beginning with that letter of the name, giving them the courage to find the way home. The book is really cleverly designed and printed on high quality, thick paper. Although there is a page designed for each letter, for example both Harry and Mia have the same page for 'a' (although still tailored differently for a boy and a girl), where there are two letters the same in a name the pages are different - Harry has both an r for remarkable and one for refreshing. The story is written in simple verse making it easy and fun to read aloud, and the illustrations really are lovely. 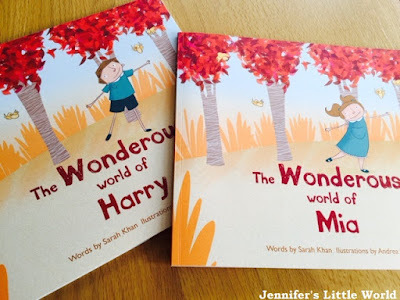 Harry was thrilled to see his name repeated all through the book and Mia was delighted too - she's now just about able to recognise her name written down. It's a lovely book to share with your child and remind them just how wonderous and individual they are. 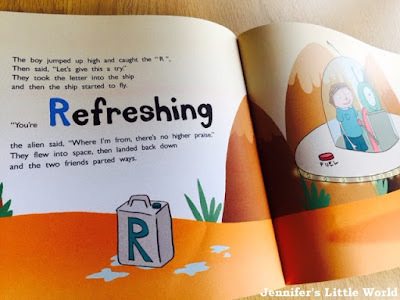 Each book also has a personal keycode which the child can use to create an online Wonderous World. You can read a continuation of the story in the book, and there is a quiz where children can answer questions based on the book. On the Wonderous Ink website you can preview the entire book using your child's name, and then if you like it you can order it there and then for £19.99, including postage and packing. Harry and Mia received a book each in exchange for this review.